Deck the halls with growlers and sifters, sip, sip, sip, sip, sip, sip, sip, sip, sip! ‘Tis the holiday ‘saison’ to be ‘mulled-y’ as the Lake County Libation Trail is making SPIRITS bright. Many of these participants on the trail have prepared holiday libations to capture their interpretation of the season in liquid format. These Lake County artisans of suds, spirits and vino have all of the festive feels for visitors during the brisk winter times. There’s a lot of family time, shopping and stress that comes along with the holiday season and sometimes you just need a break. These Lake County makers have received the message as creators pack a special holiday punch through the good, bad and tough times. If you haven’t indulged, now is the time. Here we come a-wassailing among this Lake County! Outlook: This 4.7 percent ABV lager-pale brew is introduced to the s in November for Thanksgiving and Christmas. The naturally carbonated fruity lager contains a subtle tartness due to the melody of Bosacki hops and cranberry. The Cranberry Wheat Lager provides you and the family as it’s a splendid complement to appetizers and dinner entrees. Bosacki’s Home Brew, 610 E. Hawley St., Mundelein. Outlook: Named after Historic Downtown Long Grove’s bridge that “lost a battle with a box truck,” the New England IPA has a mango and citrus flavors, perfect for the holidays. Buffalo Creek Brewing, 360 Historical Ln., Long Grove. Outlook: The Fyren Gin (pronounced Fire Engine) is not necessarily a holiday spirit, but the ‘spicy’ concept is unique. The Fyren Gin is an excellent drink to make Bloody Marys, cosmos, martinis and other types of spirits. The libation is made with a charred, roasted and gill cut serrano pepper which provides the perfect contrast of flavor and heat (especially when paired with Copper Fiddle’s Fiddle Gin). Copper Fiddle Distillery, 532 W. Route 22, Lake Zurich. Outlook: This brew ABV stands at 11.5%. The suds drink is a rye barrel-aged imperial stout complemented by Mexican chocolate, vanilla beans and other spices. Flesk Brewing Company, 200 Applebee St. Suite E, Barrington. Outlook: This vino warms the soul during the winter time. The concoction contains a half dry red wine while the other half is port. Vin Glogg is jam-packed with cinnamon, cardamon spices and it also contains an orange peel taste. Vin Glogg is intended to be served warm. Glunz Family Winery and Cellars, 888 E. Belvidere Rd., Grayslake. Outlook: The Barrel Aged Warrior Paint Imperial Coffee is taking a victory lap through the holidays as the Lincolnshire brewing company retires the drink. The 11-percent ABV stout is brewed with Mexican coffee beans from Bannockburn’s Newport Coffee House. Wonderful aromas of molasses and coffee waft from this libation and the scent is paired with hints of oak and vanilla. It’s the perfect holiday present for a parent or pal. Half Day Brewing Co., 200 Village Green, Lincolnshire. Outlook: This winter season brew is a west coast IPA. Cyniculture contains a high amount of Amarillo hops, and your taste buds will detect notes of citrus, pine and peach. The 6.3 percent abv brew has a bitter aftertaste. Outlook: This treat is served for vino fans annually at the Wheeling mainstay. The Christmas Red and White Spiced Wines are mulled libations jam-packed with aromas of cinnamon, cloves and gingerbread cookies. The red drink obtains a tad more cinnamon while the white has a bit more cardamom spice. The red and white is a perfect complement to chocolate cranberry and coconut oatmeal cookies. Lynfred Winery, 971 N. Milwaukee Ave., Wheeling. Outlook: This strong Belgian ale in Illinois’s oldest brewery has a light body, but the flavor is spicy, and the aroma has a sophisticated scent of spice and fruit blend. The Libertyville brewery’s most popular seasonal ale contains honey and dark Belgian candy sugar. The seven percent ABV magic in a glass can be compared to the similar tastes of Chimay and Duvel. Mickey Finn’s Brewery, 345 N. Milwaukee Ave., Libertyville. Outlook: The delightful spirit is created with fermented honey that turns into mead. The liqueur is and then distilled with a variety of oranges, spices and herbs. 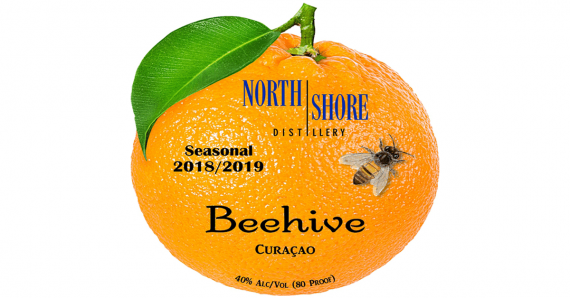 Beehive Curaçao is an exceptional sipping liqueur for the holiday season. North Shore Distillery will host the libation’s launch party on December 8 at the Green Oaks tasting room and distillery. North Shore Distillery, 13990 Rockland Rd., Libertyville. New additions to our daily offering! Winter is here, grab a beer! Outlook: The Baldwin Porter has a 6.25% ABV. The palate is roasty and chocolatey with a creamy finish smooth that’s perfect for these cold weather months. Ravinia Brewing Company, 582 Rogers Williams Ave., Highland Park. Outlook: This celebratory brew pairs perfectly with holiday meals (or for post-dinner). The flavors included peppery spices, candied oranges and floral hops providing your taste buds with decadent flavors. Roaring Table, 739 W. Route 22, Lake Zurich. Outlook: The doppelbock is a German-style lager, but is a little darker in color. The traditional double pilsner has regular hops and is listed at 7.5% ABV. Reformator comes in growlers and in cans of four packs. Tighthead celebrates their seven-year anniversary party on December 22. Tighthead Brewing Company, 161 N. Archer Ave., Mundelein. What a lovely view; if only you were full. Outlook: This versatile medium-bodied red wine has mid-range tannins; it can be paired with many dishes. The cab franc is excellent with grilled chicken, lasagna, chicken marsala or steak. The 13.8% ABV beverage has a wonderful finish and is quite smooth. Valentino Vineyards, 5175 Aptakisic Rd., Long Grove. Wine tasting stop #1 for @ashlyrevoy’s birthday! Outlook: The Antioch winery offers two delicious reds for the holiday season: the Blend Wind Punch and Rachel’s Red Frontenac Mulled Wine. The Rachel concoction is the winery’s most full-bodied red wine created from a French hybrid grape, black cherry and red currant. The Holiday Bino’s Blend Wine Punch tastes like a champagne punch with fresh cranberry and Sprite. The Vigneto del Bino Vineyard and Winery is hosting their Holiday Celebration December 9. Continue here to learn more. Vigneto del Bino Winery, 42150 Crawford Rd., Antioch. Take a walk on the Lake County Libation Trail. Click here to learn more.